It's the final day of preparations. 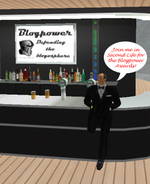 Tomorrow at 1400 London Time, the Blogpower Awards will be presented in Second Life. Yesterday, the founder and guiding spirit of Blogpower, James Higham, finally made his SL debut. After a tetchy start beset with difficulties, but with the guidance of a number of Blogpower SL veterans, I think it's fair to say our boy is ready for the big match. Here, courtesy of Free Jersey Blog, is the photographic evidence (click to enlarge). Today also saw the launch of the latest craft in Second Life to be named after a Blogpower blogger. Here is a photograph of my new space craft, the USS Higham. Congratulations, James, and here's hoping that it all goes well at the awards. Link: UK 'one of worst countries for social mobility' | Uk News | News | Telegraph. "While we continue to see a flow of negative speculation about the current state of education, the facts tell a different story. Pupils achieved the highest ever GCSE results for English and maths - meaning 62,000 more left school in 2006 equipped with the basics than in 1997." Now let's see. Which is better? academic research (aka "negative speculation") or assertions by Ministers based on data their government has rigged (aka "the facts")? Fortunately as one of those "working class children born in the 1950's" who had a better chance than his peers today, I don't have to answer the question. I know the answer because I have lived it. Nothing and no-one has done the educational opportunities of the working class in Britain more harm than the Labour Party. I suspect that Harriet Harman knows that full well, as her choices for her own children prove. We are in the final approaches now to the Blogpower Awards ceremony next Sunday. Normal service will soon be resumed at this blog, for good or ill. I thank my readers who are not attending, or who find the whole Second Life (SL) thing a bore, for their patience. I hope I have not lost you forever! The venue is ready. Those who plan to attend have set up their accounts, designed their “avatars” and are all set. The only mysteries in this respect are James and Ellee. Both have been in SL. Ellee is planning her birthday party there, but neither has made contact. It seems that Ellee, sadly, will not be able to make it to the awards. As the founder and guiding spirit of Blogpower, I am expecting James to make a suitable entrance "on the night". The "Blogpower" group in Second Life (search for "Blogpower" and join, if you haven’t already) now numbers 26. I have met all of them in SL and spent a little time with most, helping to familiarise them. Most will "attend" the awards, as will some others I know. My glamorous lady neighbour in SL (who kindly donated the DJ's (tuxedos) for the Blogpower men to wear) is getting up at 6am her time to do so (thanks, Zhu). Some Blogpower members and guests still struggle a little. Since this link (and others around the Blogpower blogs) will take them straight to the venue, they need no navigation skills. They need only master the basics, which of course include communication. The first three buttons from the left at the bottom of the SL screen are the most important for this, "IM," "Chat," and "Friends." The first message most Blogpower people received in Second LIfe was an instant message (IM) from me, (LastDitch Writer) welcoming them. The next was an invitation to be my Friend (and thus to be added to the list brought up by my "Friends" button). The third was to join the Blogpower group that I have set up in SL. Clicking the IM button allows you to send a message to your friends. I should be on your list. Add me if I am not. If you have accepted my invitation to join the Blogpower group, you can also IM the whole group at once, which may be useful if you are in trouble. IM's are forwarded by email if someone is offline, so it's worth sending one anyway. Someone may log on just to reply! IM’s are for distance communication. One common mistake is to use it when in the same space with the people you are talking to. Only the person or group you send your IM to will see it on screen. To talk to everyone "in the room" you need to use "Chat". This mistake has caused some confusion when we have had large groups assembled, as those not receiving the IM's struggle to understand half a conversation! When you get to the awards venue, just click on "Chat" and type away. Everyone in the room will "hear" you by seeing the text (prefixed by your name) on their screens. Find a place to stand (out of the way of the incoming teleporter please). You can close your IM box. Some of you have become adept at using SL gadgets. Bag Writer set off some fireworks on my airship last night. Very pretty, but please don't do things like that on the night. Our region of SL will have more people than usual in it, and we may suffer from server lag and other problems - even a crash - if people run too many "scripts" (little SL programs) to use such devices. No weapons please, of any kind. The security bot will eject you if you pull a gun! If we DO have a crash, don't panic. Simply restart SL, making sure to ensure that you are set to return to your last location. You will resume your place in the room. If you have questions in the next few days, please IM me in SL or email me direct. I want this event to be a huge success and will do my very best to help. I will be devoting my blog to adverts for the event for the rest of this week. Please email me for suitable graphics to use for this purpose if you would also like to promote it. Please link the graphics to this URL, so that people can teleport to the location in SL directly from your blog. I would appreciate all the help you can give . I have hired an SL and general tech guru, Abramth Asp, to be my estate manager in SL (I have a real life and a blog to run, you know!). He will be on hand to help out anyone who gets stuck or lost during the event, when I may be a bit too busy to do so. By all means add him to your list of SL friends. If you are in trouble during the event, just send an IM to Blogpower and one of us will help out. I look forward to seeing you all on the day. It's not to late to set up a free account and join us. Don't leave it too late. You need a bit of practice in advance. Welshcakes Limoncello's popularity and influence in Blogpower is rivalled only by that of Ellee, Ruthie and of course "Mr Blogpower" himself. Since she first registered her SL identity (Welshcakes Rossini) a number of people have told me they were "hanging around" in SL in the hope of meeting her. I am delighted to report that last night (my time) we finally met! She made it to the bar of the airship named for her, where the Blogpower SL'ers will meet before and after the ceremony (and where you are all welcome to join us). She is looking good, but her computer is still struggling to cope with the demands of the graphics-intensive SL software. Still, she made it and we can now all hope she will be there on the night. I am just sorry that I was so excited to see her there that I forgot to capture the moment with a snapshot. (Cross-posted to Defending the Blog , Nourishing Obscurity and The Blogpower Express). The dance floor is now set up by the bar in the ballroom of the Air Liner "Limoncello". Blogpower members are welcome to join me here in the half hour before the ceremony on July 1st for a bracer or two before the big day. All guests are welcome to head back to the bar when the presentations are over. A teleport link will be provided direct from the Awards venue. I don't dance in RL, but in Second Life you use dance balls like the one in the picture to animate your avatar. So I can dance as well as anyone else. Several Blogpower members are now regular visitors to our awards venue in Second Life. I am missing a lot of sleep chatting to them because of time differences, but it's fun. Welshcakes has run into technical difficulties, but we are hoping that Ian Appleby at Imagined Community will be able to help her out. Continuing the tradition of naming my collection of boats, planes and airships in Second Life after the women of the Blogpower cooperative, here is the latest vessel, a 124 metre long airship cruise liner, the Limoncello. She currently floats majestically above my land at an altitude of 700 metres. Let's hope Ian can help Welshcakes see her namesake. I have built a bar in her ballroom for after the ceremony and hope to see you all there for a beer. Here's a picture of that, with me wearing one of the tuxedos I have distributed to our male Blogpowerers so that they can try to live up the the efforts being made by the women. I must remember to lock the controls of the airship first though. Blogpower members have already crashed the SS Ruthie and the Lady Ellee, and sunk the Lovely Liz in their enthusiasm to "have a go" in this virtual world. Link: Adam Smith Institute Blog. The news of our Awards Ceremony has featured in the Adam Smith Institute's "blog review"
Link: BBC report finds bias within corporation | Uk News | News | Telegraph. So? Please tell us something we didn't know. Did anyone think that a broadcaster capable of lauding Cuba's healthcare was unbiased? That a broadcaster which consistently pits the least videogenic Tories against the best from other Parties on Question Time was balanced? The BBC knows how biased it is. So the only interesting question is why it commissioned this report.